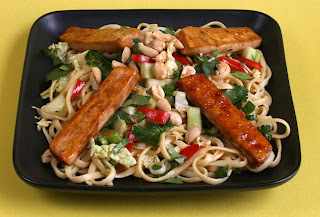 I had some tofu and cooked linguine in the refrigerator, and that was all the incentive I needed to make the Spicy Tofu Noodle Salad from American Vegan Kitchen by Tami Noyes. If you don’t know about this fantastic new cookbook, you can check it out on Amazon. American Vegan Kitchen is filled with full-flavored comfort food recipes — vegan versions of diner and bistro favorites as well as loads of homestyle recipes, just like mom used to make, assuming that “mom” was a great vegan cook! 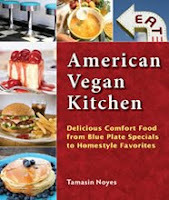 I’ve already tried lots of recipes from American Vegan Kitchen, including the Seitan Katsu with Tonkatsu Sauce, the City Skillet, Mustard-Mac Slaw, San Fran Seitan Wraps, Bistro Asparagus Twists, and the Lettuce Wraps. They were all great, so it was no surprise that the Spicy Tofu Noodle Salad was a winner as well. Made with lots of fresh veggies and a flavorful sauce redolent of ginger, garlic, soy sauce, and chili oil, this satisfying salad was delicious, easy to put together, and a great one-dish meal for Spring. My favorite sandwich in the world is the Vietnamese bahn mi. Each time I make these sandwiches, I tweak the ingredients just a little, sometimes adding shredded carrot or onion, other times just cucumber and lettuce — always lots of cilantro. I usually make them either with seitan or soy-tan dream cutlets (from 1000 Vegan Recipes), although I’ve also added thin slices of marinated extra-firm tofu on occasion. The version I made for lunch yesterday was the best I’ve ever had. Here’s how I made them: I sautéed slices of seitan with some hoisin sauce and a little soy sauce which gave the seitan a wonderful flavor. I combined Vegenaise and sriracha sauce and spread it onto split rolls. Then I layered the rolls with lettuce, sliced cucumber, the hoisin-flavored seitan, loads of cilantro, and a generous sprinkling of chopped jalapeño. The combination of flavors and textures was out-of-this-world fabulous. I think it was the addition of hoisin to the seitan that put the flavor over the top. And of course, the sriracha mayo only made it even better. 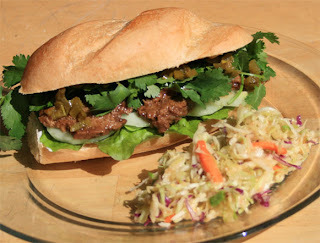 If you’re a fan of bahn mi, give this a try and let me know what you think. From chicory and escarole, to chard and spinach, I love greens — all kinds, prepared all different ways. Because of my fondness for greens, I look forward to St. Patrick’s Day. It gives me an excuse to go even more green than usual. One of my favorite Irish recipes is colcannon, a dish made with mashed potatoes and either kale or cabbage. 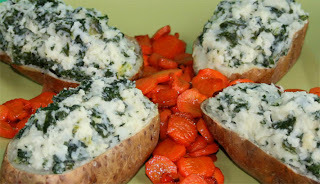 This St. Patrick’s Day, my colcannon has a new twist: Colcannon-Stuffed Baked Potatoes. More convenient than making mashed potatoes at the last minute, these are ideal for making ahead. You can bake the potatoes ahead of time and assemble them early in the day. They’re then ready to go into the oven to heat at dinnertime. To make these, simply bake some russet potatoes. Once the potatoes are baked, cut them in half lengthwise and scoop the potato into a mixing bowl, leaving about 1/4-inch of potato with the skin, so they have enough stability for stuffing. Set the potato skins aside. Mash the potatoes in the bowl and mix with finely chopped cooked kale, Earth Balance, minced scallions, a splash of warm soy milk, and salt and pepper to taste. Spoon the colcannon mixture into the potato skins and arrange in a baking dish. You can then bake them immediately until hot or cover and refrigerate and then bake them when you need them. For St. Patrick’s Day, I serve these potatoes with roasted carrots to represent the colors of the Irish flag. Oscar Party? Pastry-Wrapped Stuffed Olives! If you need an award-winning appetizer to serve at your Oscar party, try these pastry-wrapped olives stuffed with walnuts and raisins. This combination of flaky pastry, piquant olives, crunchy walnuts, and golden raisins adds up to one delicious appetizer. Easy to make, they also provide an off-the-chart “wow” factor that can come in handy when you want to make something special for guests — or even yourself on Oscar night (or anytime). I’ve adapted this recipe from an even easier version in Quick-Fix Vegetarian, where I use large green olives that are sold already stuffed with either almonds or jalapeños. The pre-stuffed olives are then wrapped in little squares of pie crust pastry and baked. These tasty bites look fussier to make than they are, and the texture and flavor combination is out-of-this-world delicious. For my latest version, I use puff pastry instead of pie crust pastry for added richness and flaky goodness. The puff pastry is also easier to work with. I stuff the olives myself with various ingredients. Some of my favorite stuffing combinations are: sweetened dried cranberries with pecan pieces; jalapeño with smoked tofu; roasted garlic with sun-dried tomato; and (this time) golden raisins with walnut pieces. I've tried it with different kinds of olives, including kalamata, but the ones I like best for this are the large pitted green olives from the olive bar at the supermarket. 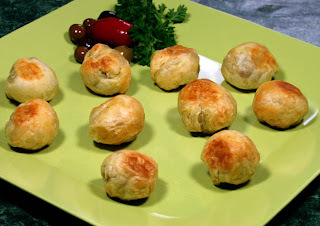 If you like the idea of stuffed olives and flaky pastry all in one bite, give these a try. And if you come up with more stuffing ideas for them, I’d love to hear about it. To save time, use bottled green olives that are already stuffed with almonds or jalapeños. Adapted from Quick-Fix Vegetarian. 1. Preheat the oven to 400°F. Stuff each olive with 1 raisin and 1 walnut piece (or your stuffing of choice). Set aside. 2. Roll out the thawed pastry. Use a sharp knife or pizza cutter to divide the pastry into 25 to 30 (2-inch) squares. 4. Bake until golden brown, about 15 minutes, turning once, about halfway through. Serve warm or at room temperature.